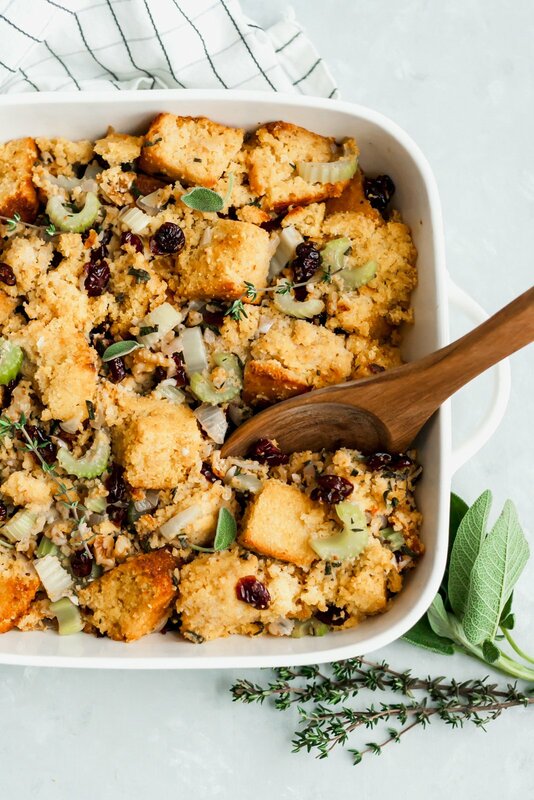 Who else remembers this yummy cornbread stuffing recipe from last year? ME! It was so good, I had to share it with you again, but this time with new photos and a video so that you feel inspired to run to the store, grab the ingredients and make it ASAP! In the thanksgiving of my dreams, I have sweet cornbread drenched with honey butter. There’s also fresh cranberry sauce with a hint of bourbon, sweet potato casserole, fresh green bean casserole (coming to the blog soon!) and creamy silky smooth mashed potatoes (also coming soon!). Finally, pumpkin pie! 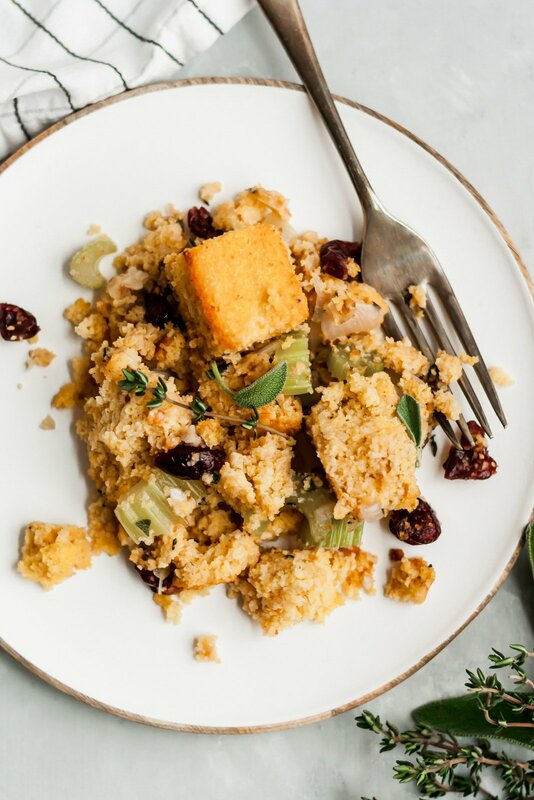 Today’s thanksgiving inspired meal involves putting two of my favorites sides together: cornbread + stuffing. Or as some people refer to it: dressing. Truth be told, I never loved stuffing until a few years ago when I started creating my own and now it’s one of my favorite sides EVER. Frankly, I wish could dive in this dish like an Olympic swimmer. 1. homemade GLUTEN FREE cornbread! 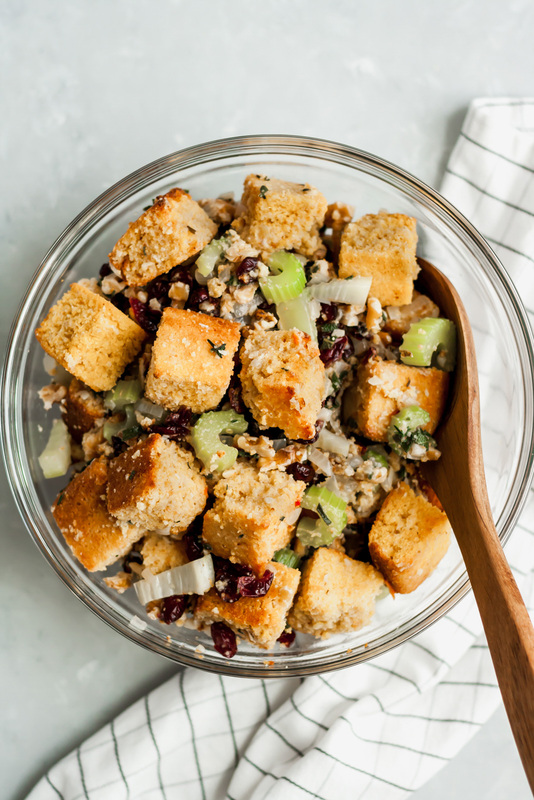 This cornbread stuffing recipe is made with gluten free oat flour and it IS FANTASTIC 😍seriously oat flour is life and you can easily make your own by simply blending oats in a blender until they resemble flour! 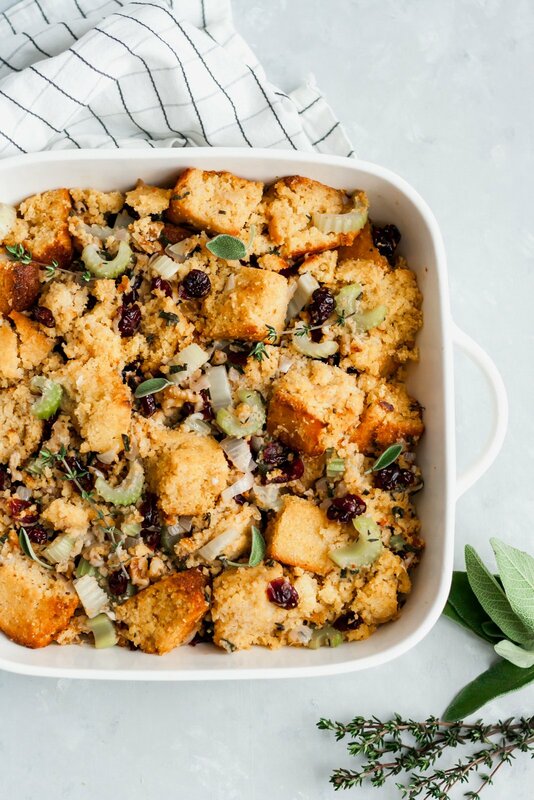 I REALLY hope you get a chance to try it out because like I said, it’s my favorite stuffing in the WORLD. 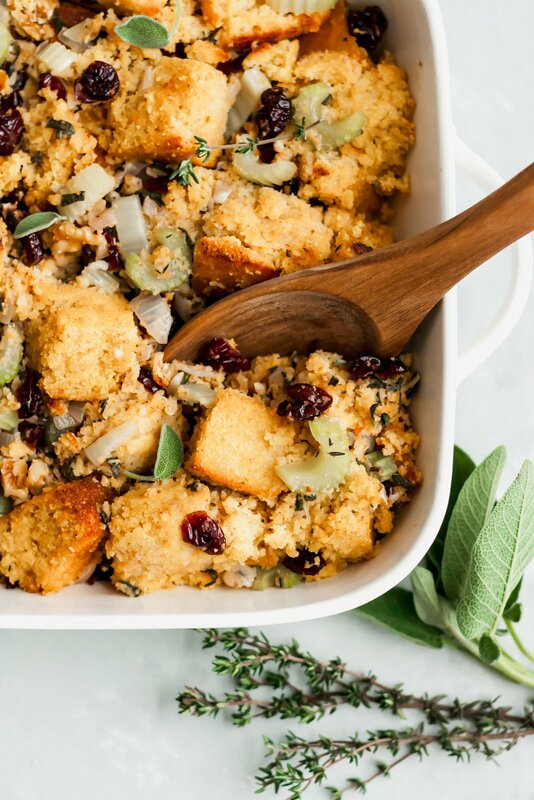 The cornbread can be make a day ahead of time, so keep that in mind when prepping for the big Thanksgiving day! If you make this recipe leave a comment below to let me know how you liked it! Be sure to tag #ambitiouskitchen on Instagram so that I can see your creations. Xo! To make the cornbread: Preheat oven to 400 degrees Fahrenheit. Grease a 10 inch skillet or a 9×9 inch baking pan with nonstick cooking spray. Next, reduce head in oven to 350 degrees F. Cut the cornbread into 1 inch cubes (or 1/2 inch if you prefer smaller bites) and place them on a baking sheet. Spray the tops of the cornbread with nonstick cooking spray or drizzle with olive oil. Bake for 20 minutes to dry out bread. While the cubes are baking, place a large skillet or pan over medium heat. Add in butter, garlic, thyme, sage, onion, celery and salt. Saute for 4-5 minutes until onion has softened. Transfer mixture to a large bowl and add in the cornbread cubes, beaten egg, vegetarian broth, cranberries and walnuts. 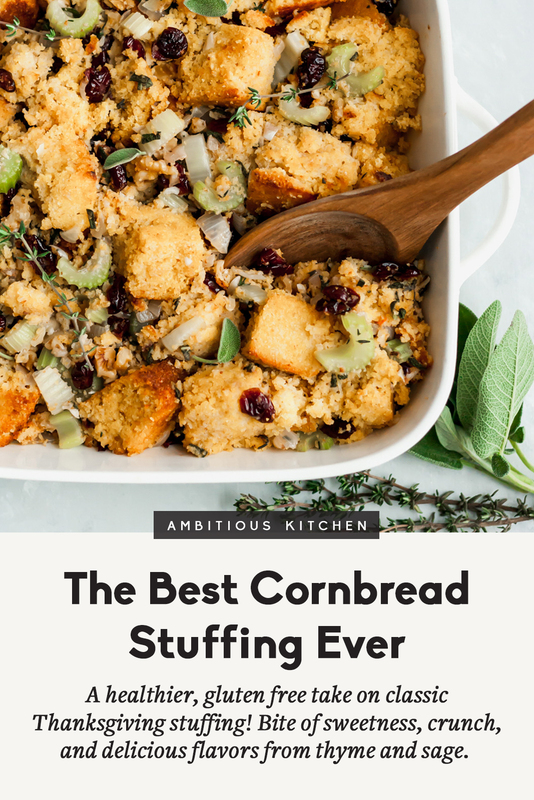 Gently toss to combine, making sure to try and keep some of the cornbread cubes intact. If you want to make it in the turkey: Stuff the cavity of the turkey. Otherwise to bake separately: add the stuffing into a greased 9×9 inch baking dish and dot the top with butter pieces. Cover with foil and bake at 325 degrees F for 20 minutes. To make this with store-bought cornbread: If you’d like you can make this recipe with store-bought cornbread (it may not be gluten free though). Just continue with the recipe with step 3: drying out the cornbread after cutting into cubes, etc.